Fragile X syndrome (FXS) is a genetic condition that causes intellectual disability, behavioral and learning challenges, and various physical characteristics. Though FXS occurs in both genders, males are more frequently affected than females, and generally with greater severity. Life expectancy is not affected in people with FXS because there are usually no life-threatening health concerns associated with the condition. We provide unwavering support for every family affected by Fragile X, while relentlessly pursuing a cure. Learn about Fragile X and read in-depth articles for daily living strategies. Find events and local community groups near you. Find a clinic and get involved in current research projects. Riley was born with Fragile X, and when he was first diagnosed, his parents were told he would never walk, talk, or do much of anything. 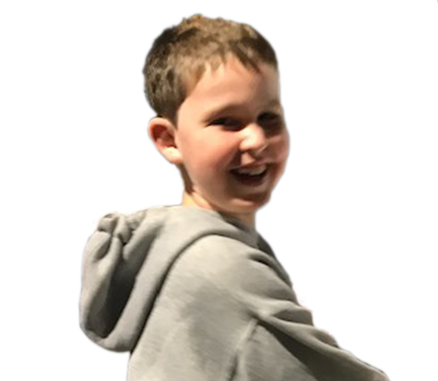 Today, Riley is 10 years old, a wonderful student, and is making his own dream come true: his dream of becoming an astronaut. Awareness - To increase public and professional awareness of Fragile X to influence public policy, support legislative advocacy, and increase funding for research. Research - To fund and facilitate research that drives scientific and medical advances toward effective treatments and a cure. Community - To assist and educate individuals and families living with Fragile X in all stages of life, through outreach and personal support. Interested in connecting with a larger community? We’d love to hear from you! Check out the number of ways to get involved.